Find your soul mat: 4 sticky mats tested | YOGALEN. Dynamic yoga in Glasgow. 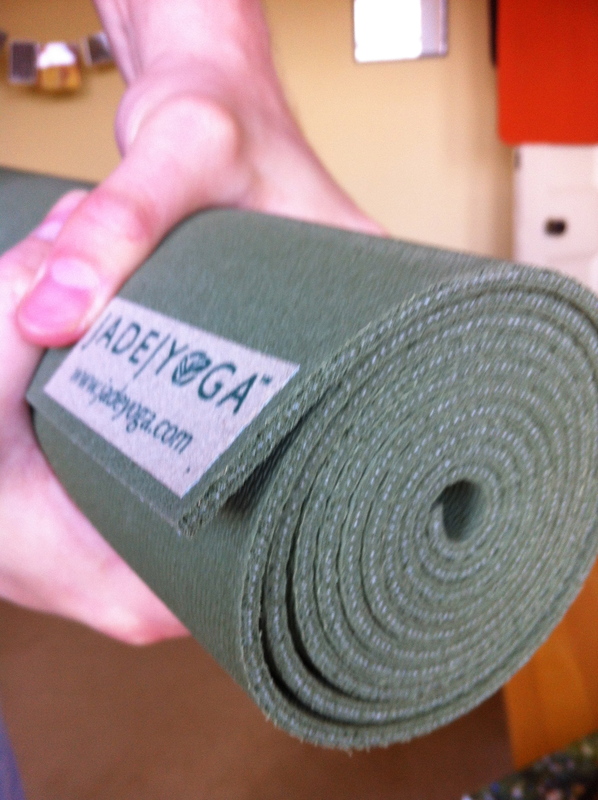 The problem with most yoga mats – even the ‘sticky’ ones – is that they aren’t that sticky. You get to maybe the third downward dog and the thing’s slippery as eels. You find yourself doing that awkward thing of walking your hands backwards while trying to look all still and strong and comfortable. And if, like me, you tend to have sweat dripping off your nose at the twenty minute mark, then it might be an idea to get a stickier sticky mat. The main thing here is grip. After that, I looked for eco-credentials, durability, and weight (cushioning, how solid it feels, what it smells like were also factors, but they don’t get ratings of their own). And price, obviously. All these things are variables according to how yoga fits into your life – it’s your call. Grip is the one thing you really need it for, though, and everything else is secondary. The grip sticky mat is the one to start with, if you sweat a fair bit but there’s no way you’d shell out more than £20 on a mat (yet). 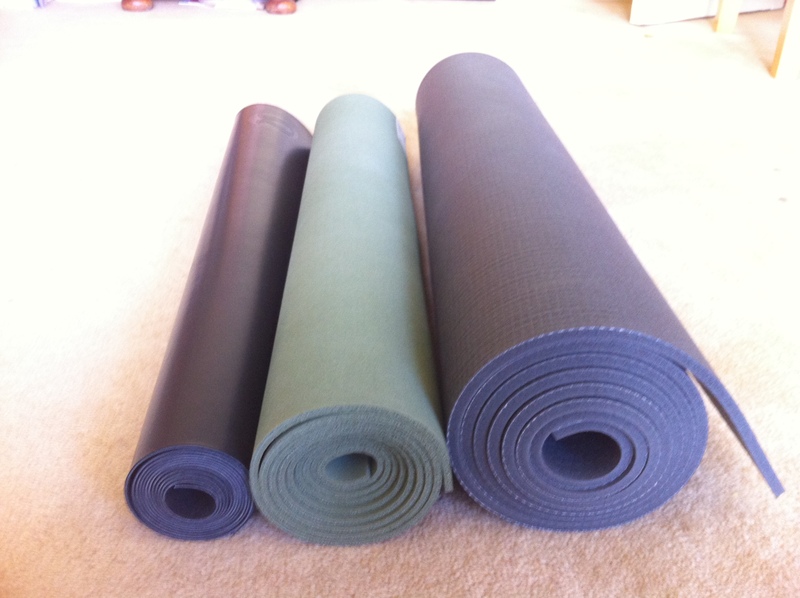 Plus there’re loads of colours to choose from, which is great you feel like matching your mat to a favourite chakra. (Yeah chakras come in loads of colours, too, like the marketing guys who came up with chakras were like ‘hey – loadsa colours is, like, the cutting edge these days. Big data. Going forward, chakras should be in CMYK – Chris, we should be on it. Let me know when you’ve actioned it.’ etc). So the Grip Sticky is 5mm thick, 180mm long and 60mm wide, which are pretty standard dimensions that’ll do for most people. It’s a little bit too squishy for my liking, and it won’t stand up to a regular vinyasa practice (3 times a week or more), but it’s immediately sticky so it gets a spot on this blog. The Jade mat is lovely. Natural rubber, biodegradable, a little heavier than the grip sticky mat, which is reassuring. It’s also 100% grippy straight out of the box. The extra weight means it grips the floor, too, so you don’t go sliding around quite so much when perfecting those jump-throughs. I took this one to a sweaty Forrest yoga class for two and half hours with only a bit of slippage (awful word) towards the end. You’re gonna need a bigger bag. The Manduka Black Mat Pro is long, thick, and heavy. Sure it’s not great for running around around town with, and it’s no good if you just want to hold it while you get youself a compost smoothie. But for comfort, stability, and longevity it’s unrivalled. It’s expensive, for sure, but you get a whole lot more bandha for your buck. It’s the only one of the four that came with a lifetime guarantee, as well as a challenge to practise every day just to test that guarantee out. I tested the extra long option, and it’s awesome. The Jade mat has an option for similar dimensions, and if you can spare the extra couple of quid and you’re taller than the average yoga pixie then a bit of extra space is great. There is a funny coating on this one when it arrives, but as directed by the manduka literature I rubbed it down with sea salt and it seemed to do the trick. Like the three bears, Lulu, Jade and Manduka. This is the opposite of the Black Mat Pro. It’s at the other end of the mat spectrum, a super-slim 1.5mm thick and 0.9kg Un Mat [the website only has pink versions. The one they sent me is black]. It’s also the stickiest thing I’ve stood on since I stood on a sticky bit of kitchen floor a couple of days ago. Cushioning is non-existent, which doesn’t matter if you practice at home on a carpet, and shouldn’t matter if you lay it over the top of one of the studio’s mats. It’s a neat sidestepping of the problem of carrying a mat around with you. And did I mention the stickiness? Like srsly, it’s the best. And if I had to keep just one of these mats? Tough choice. They’d all make it to the Which? Best Buy section. If I kept just one, and I chose for stickiness alone, it would be the Lululemon Un Mat. For all-round awesomeness, for a mat that makes you want to turn up every day for practice, it’d be the Manduka. You can buy a chalk ball for a couple of quid, which is great (I have one in the studio! ), but it does tend to cover you in thin white dust. If you don’t want to carry a mat around, a yoga mat towel like this one can be handy, but it tends to ruffle up and twist during practice (I once used four tiny bullclips to attach the towel to the mat, but that’s way too dorky). You could also go for Manduka’s Shama yoga rug, or one of the many variations that are out there (Manduka’s has neat ridges where your hands and feet go, which helps). The yoga rug look will get you extra kudos for looking like an authentic Mysore ashtangi, too. 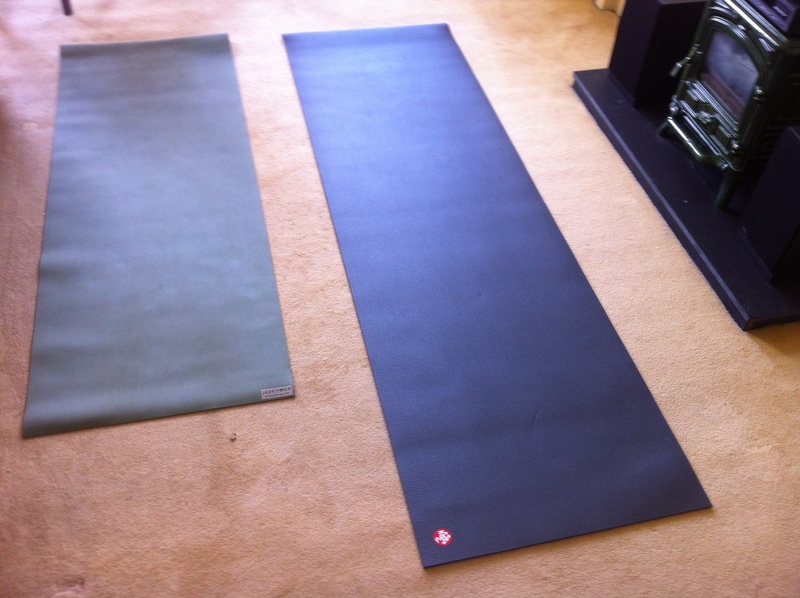 This entry was posted in Blogs and tagged Glasgow yoga, vinyasa flow, yoga mats, yogalen. Bookmark the permalink. Thanks. One Jade Harmony Mat (Saffron obviously) about to join our yellow mat collective.